Home » Academics » Schools » College of Arts, Humanities and Social Sciences » Faculty » Brother Dennis R. Bautista, S.M., Ph.D. Brother Dennis R. Bautista, S.M., Ph.D., has been sharing his knowledge and expertise on communication arts with St. Mary’s students since 2006. A professed member of the Society of Mary, Bautista also has professional experience as a radio disc jockey, graphic designer and multimedia specialist. Academically, his research has focused on media effects, ethnic identity, acculturation and socialization. Prior to teaching at St. Mary’s, he was a member of the faculty at Chaminade University of Honolulu, our sister Marianist institution, teaching in the Communication Department and advising the student newspaper. A member of the Casa Maria Marianist Community, Bautista views his work at St. Mary’s as a ministry in assisting students discern their professional and personal vocations. He has great pride in students’ successes in and out of the classroom – whether it is overcoming obstacles and personal growth; winning state or national awards at media conventions; maturing to become peer mentors, leaders and role models; or returning as alumni to share their life stories beyond St. Mary’s. 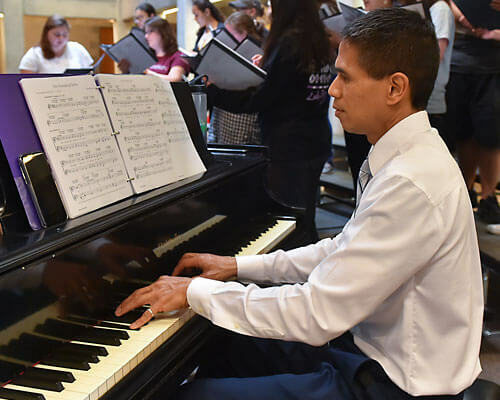 In addition to his teaching duties, Bautista is also the faculty adviser to the student newspaper, The Rattler, moderator for the President’s Ambassador Program and accompanies the University Chapel Choir. In 2013, Bautista received the Distinguished Faculty Award established by the St. Mary’s University Alumni Association.